Share the post "Touch-me-not Plant: Mimosa Pudica"
Mimosa belongs to the taxonomic group Magnoliopsida and family Fabaceae, subfamily Mimosaseae. In Latin it is called as Mimosa Pudica Linn. The species epithet, pudica, is Latin for “bashful” or “shrinking”, alluding to its shrinking reaction to contact. Common Names: Sensitive Plant, Touch-me-not Plant, Shameful Plant, Sleepy Plant, Humble Plant, and Chuimui. Appearance-wise, there doesn’t seem to be anything unusual about this annual or perennial plant. The plant looks normal. 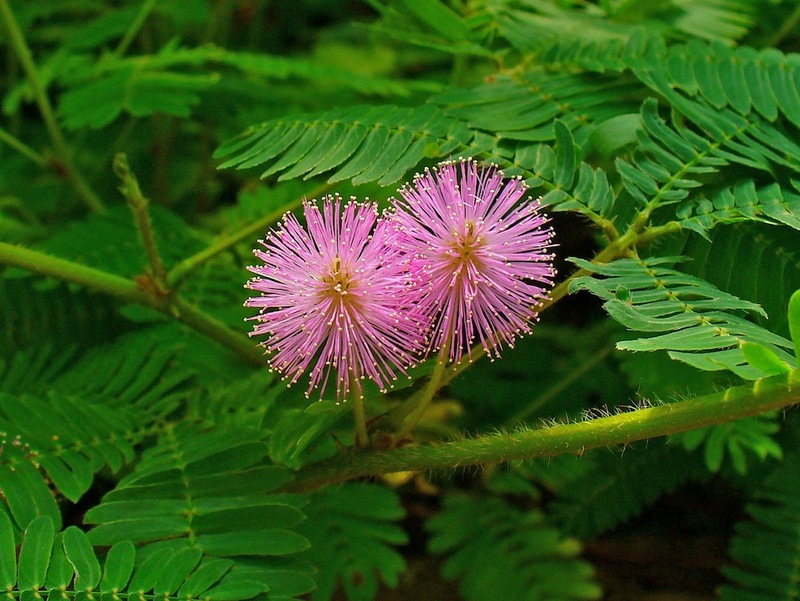 The Mimosa Pudica is a low-growing, creeping plant with slightly prickly, woody stems. The leaves are feathery and fern-like. It blooms fluffy ball-shaped pink or lavender flowers. But appearances are deceiving! You wouldn’t know by just looking at it, but the Mimosa Pudica is a peculiar plant. It is a bit shy and doesn’t like being touched. Or so it seems. When stimulated by touch, heat or wind, the feathery compound leaves will fold inward or droop and will open a few minutes later. It’s like it’s playing dead. It also closes during darkness and reopens in light. The reasons for this unusual behaviour are still unknown. Some say it could be a defense mechanism-to protect itself from predators. Another possible explanation is that the sudden movement gets rid of harmful insects. The speed of the response depends on the magnitude of the stimulus. Hitting the leaf hard with the flick of a finger will cause the leaf to close in the blink of an eye whereas a gentle touch or modest heat source applied to leaflets at the tip of a leaf will result in a slower response and the propagation of the stimulus along the leaf can be observed. This plant is native to South America and Central America, but has become a popular household plant around the world. For the young and the young at heart, the Sensitive Plant will bring hours of fun! It is often grown as an indoor annual, but could also be grown in the garden as ground cover. It flowers all year round and is easy to maintain. It grows mostly in shady areas, under trees or shrubs. • The name Pudica means “shy, bashful or shrinking” in Latin. • The plant will also close its leaves in darkness and opens in light. • The plant contains the alkaloid mimosine, which is toxic to humans and animals in large doses. • The plant can produce over 600 seeds per year. • The plant is used in traditional medicine in parts of Southeast Asia and Africa. • Aqueous extracts of the roots of the plant have shown significant neutralizing effects in the lethality of the venom of the monocled cobra.